Preventive dentistry services allow the Pleasant Grove Family Dentistry team to help patients keep their smiles whole and healthy. Torrin Marracino, DDS and his Texarkana dental team offer a variety of general and preventive dentistry services to avert oral health issues, and diagnose and treat others in their earliest possible stages. Contact our team if you have questions or would like to schedule an appointment. We welcome patients from New Boston and other nearby communities in our state-of-the-art Texarkana, TX dental office. Preventive dental checkups and professional teeth cleanings are the two most important components of preserving oral health care for your family. 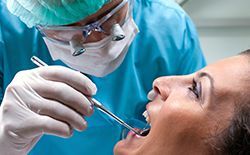 During these six month checkups, we screen for common oral health conditions, and one of our hygienists will carefully clean even the hardest to access parts of patients’ smiles. If we notice any areas for concern, we partner with patients to develop a plan for ongoing care. Applying dental sealants is a quick, painless way to protect teeth from decay. We can apply sealants as part of any regular dental checkup, and with proper care, they last years. Sealants are applied in a liquid form directly onto the teeth. They fill gaps in the biting surfaces where bacteria and plaque may accumulate leading to tooth decay. 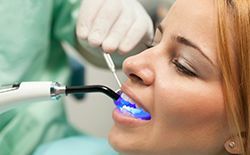 We use a curing light to harden the sealant onto teeth. This creates a clear coating that completely seals out bacteria and plaque. We recommend dental sealants for young patients who are still learning to properly brush and floss their teeth. However, adults who are also prone to decay may benefit from the application of dental sealants to prevent cavities. Temporomandibular joint (TMJ) dysfunction and bruxism, nighttime grinding and clenching, may have different causes, but in many cases, they can both be treated with the same comfortable solution – nightguards. These custom crafted guards reposition the jaw in the most comfortable resting place. They also create a physical barrier between teeth that prevents potential wear from grinding and clenching. Screening for oral cancer is completed quickly and comfortably as part of every six month checkup at Pleasant Grove Family Dentistry. We carefully examine patients’ oral and facial structures looking for early warning signs of oral cancers. This includes discoloration of the soft tissue, lumps or bumps in the soft tissue, hoarse throat, or difficulty swallowing. 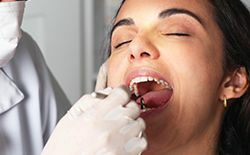 When diagnosed in the early stages, patients may be able to make a full recovery, but diagnosed in later stages, oral cancer has one of the highest mortality rates. In fact, more than 50% of those diagnosed with oral cancer each year die within five years of their diagnosis. 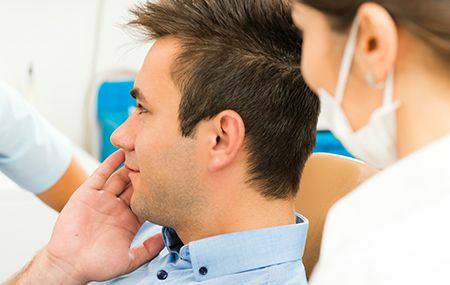 We screen for oral cancer regularly to increase patients’ chances to make a full recovery. Periodontal (gum) disease is one of the most common oral and overall health conditions among US adults. 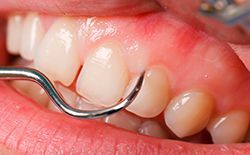 It occurs when plaque or tartar buildup at the gum line irritates soft tissue creating sores and potentially breaking down connective tissue. In the earliest stages, known as gingivitis, gum disease has extremely mild symptoms. They may include discolored gum tissue and bleeding while cleaning teeth. 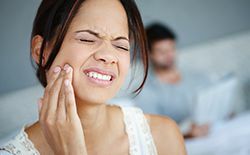 In the more advanced stages, periodontitis, gum disease has symptoms such as a bite that doesn’t fit together properly, chronic bad breath, teeth that shift, and even tooth loss. 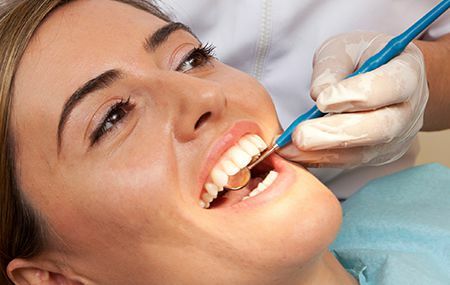 We offer a variety of treatments for gum disease. In the early stages, more frequent cleanings are likely adequate to renew oral health, but as the disease advances, we may recommend scaling, the systematic removal of plaque and tartar buildup, and root planing, the smoothing of tooth roots to prevent future buildup.